Anyone approaching a new production of such an iconic and well-loved favourite as Alain Boublil and Claude-Michel Schönberg’s Les Misérables is likely to do so with some trepidation. Puzzling over how to give the show and its fans the best 25th Anniversary present, Cameron Mackintosh decided on a completely new staging, as if it were a brand new piece. This stunning production, which began its tour at the Cardiff Millennium Centre, does not seek to replace the original but to sit happily beside it in an exciting, fresh new way. There are fabulous new orchestrations (based on John Cameron’s original ones) by Chris Jahnke, Stephen Metcalfe and Stephen Brooker. They were first heard at the 2006 Broadway revival and have now been polished to perfection, in close collaboration with Claude-Michel, and they add greatly to each characterisation and dramatic scene. Set design and direction go very much hand in hand and it can’t have been easy to parallel the work done by John Napier, Trevor Nunn and John Caird. But this is exactly what has been achieved. Matt Kinley, responsible for the new design, starts from scratch and is richly inspired by the paintings and drawings of Victor Hugo. He makes great use of chiaroscuro, creating effective contrasts of dark and light and this production is altogether brighter and more colourful. There is no revolve and the projected time and place titles are unnecessary because the new design grounds the action very precisely and visually in its location. The succession of projected images, together with Paule Constable’s imaginative lighting, create mood and atmosphere and range from port scenes to the rural, wooded backdrop for the Thénardier’s inn at Montfermeil, and from the factory chimneys of Montreuil-sur-mer to the narrow alleyways and streets of Paris. They are at once realistic and impressionistic and seem to have a life of their own as chimneys smoke or colours subtly change in accordance with the seasons or time of day. The projection which accompanies Stars is a breathtakingly beautiful view of a bridge over the Seine with the Paris skyline behind and as the song progresses the sky darkens and the stars brighten like a living work of art. The ability for the projections to show movement adds greatly to the sense of drama. In the runaway cart scene, for example, the projected street image recedes so rapidly that the cart appears to travel at breakneck speed. And in a similar way a different projected street draws back to give the illusion of the apparently forward-marching students in One Day More. One of the most remarkable scenes is the sewer scene. The moving projection of the cavernous underground tunnel, together with the echoing music, gives the spine-tingling impression of Valjean struggling ever deeper through the myriad twists and turns. The sets, however, are not solely reliant on the projected images but these work together with the complex physical structures which add significantly to telling additional details of the story. The show begins, not on the chain gang, but with the convicts rowing a ship, moving the oars rhythmically in time to the music. The tall Paris tenements can be seen at each side and enable multi-level staging, with characters appearing on balconies and at windows, which is especially effective in One Day More. The factory scene reveals the girls sitting at a workbench polishing the black beads that are responsible for Valjean’s wealth and the town’s prosperity. There is a ramshackle structure of the Thénardier’s inn, with a first floor bedroom where he is at first asleep, and a staircase which he drunkenly staggers down. The barricade, which appears complete on the stage, is somewhat smaller than John Napier’s original, but nevertheless impressive. The only time I missed the revolve is when we are unable to witness Gavroche’s death, although we do see the other characters’ response to it. 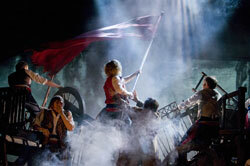 And finally the barricade parts to movingly disclose the bodies of Gavroche and Enjolras draped on a cart. 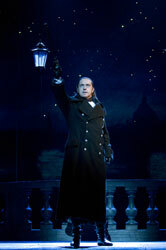 Javert’s suicide scene is so utterly spectacular that it defies description and has to be seen to be believed! Cameron Mackintosh is renowned for putting on touring productions of the same standard as the West End or Broadway and there is a superb cast, many of whom were not even born when the show first opened. The show is innovatively directed by Laurence Connor and James and Powell, who make excellent use of the multi-level sets. 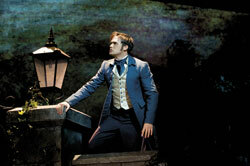 John Owen-Jones has played the role of Jean Valjean many times and gives an unparalleled performance. His silky smooth voice makes Bring Him Home an absolute joy, while Earl Carpenter’s superb Javert is also in fine voice and a perfect foil. Madalena Alberto gives a soulful performance as Fantine and Rosalind James is a heart-breaking Éponine. The Thénardiers, played by Ashley Artus and Lynne Wilmot introduce a great deal of fun and mischief into the show, while Ashley gives us rather more dance at the inn, and, picking up on the line from the wedding scene, he truly becomes ‘Master of the dance’. Katie Hall as Cosette and Gareth Gates as Marius make an endearingly romantic couple and I’m sure Gareth will win the hearts of many young ladies in the audience too. During his haunting rendition of Empty Chairs at Empty Tables the pathos is accentuated as the students, each holding a small lamp, blow out their candles, and with great simplicity symbolise the snuffing out of their lives. When we first see little Cosette she is standing centre stage with her enormous, oversized broom, and this makes a haunting visual image, drawn from Emile Bayard’s original lithograph. I also loved the inclusion of the fleeting, wordless scene with Petit Gervais, who drops his forty-sou piece. When Valjean steps on the coin and frightens the little boy away, he technically becomes a thief on parole, which, in the novel, is the principal reason for Javert’s continued pursuit. It’s a delight to see such things so effortlessly staged. Although every word of Herbert Kretzmer’s much-loved lyrics is the same, the new orchestrations, direction, staging and lighting tell the story in a stimulating and refreshing new way that enables us all to dream a new dream and take us on a new adventure that we cannot fail to enjoy. Vive la difference!